John Lerma’s best-selling book, Into the Light, inspired thousands of readers to discover not only what awaits us as we prepare to make our journey from earth to heaven, but, more importantly, how to achieve heaven on earth. 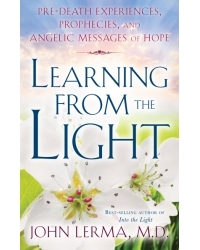 In Learning From the Light, Dr. Lerma shares more angelic messages given to his patients and more stories from and about survivors who have experienced the loss of a loved one...and their visits with angels. • Messages about the future of the world. • Lessons on how to prepare for a peaceful and joyful transition to the next world. • Selfless suffering and its effect on humanity. • Electronic voice phenomena (EVP). • Interactions with white angels and dark angels. • How to achieve heaven on earth. • How to achieve self-forgiveness and self-love. • How to disconnect from your ego to awaken your spiritual self. Religious skeptics often claim that heaven’s existence cannot be proven, because no one has ever returned to talk about it firsthand. This is the book that proves them wrong.